Harry Potter's Owl plays an important part through the first six books by J.K. Rowling. Here all what there is to know about her, from name to type plus some fun facts. Hedwig, as Harry Potter's owl is called, accompanies the wizarding boy from his first day in this new and exciting adventure. She is his companion at Hogwarts as well as giving him support and friendship when he has to spend the vacations at the house of his Muggle relatives / the Dursley's. Hedwig, Harry Potter's owl, makes her first appearance in the book 'Harry Potter and The Philosopher's / Sorcerer's Stone'. She is a birthday present from Rubeus Hagrid, the 'Keeper of Keys and Grounds' at Hogwarts, to Harry during their first visit to Diagon Alley. She accompanies Harry through his time at school and serves as link to the magical world when he has to spend the holidays at the home of the Dursleys, his Muggle relatives. 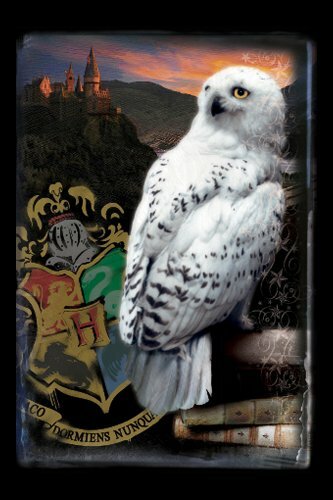 Hedwig is an accomplished post owl and can find the recipient of a message without the need of an address. Additionally she is highly intelligent and often takes the initiative, for example, when she visits Hermione to make sure that Harry gets his birthday presents from her. She is also a very proud bird and over the years she and Harry have some minor fall-outs which never last very long. In the books she described as eating nuts and 'owl pellets', together with the prey she hunts, but in reality this type of owl is an exclusive meat eater (see below). Harry names her after a witch he finds mentioned in one of his first school books, 'A History of Magic' by Bathilda Bagshot. The only thing that J.K. Rowling herself mentioned in interviews about her name choice for Harry's owl is 'Hedwig was a Saint'. Now there are two saints of this name in the calendar, one is 'St. Hedwig of Silesia' (1174-1243) and the other is St. Hedwig, a polish queen that lived from 1373 to 1399. Both were known for caring for the poor, needy and orphans and in the case of the first one, an order that carried her name was later founded and she was chosen as the Patron Saint. This order, 'The Sister of St. Hedwig' exists until today and runs schools and orphanages. There are currently around 300 St. Hedwig Sisters worldwide. As Harry himself is an orphan, it is only fitting that his first friend was named after this special saint, as he needed the protection of 'St. Hedwig' ;-) It is little details like this, that make the >Harry Potter Series< so special and great fun to research more in depth for fans like me! Hedwig is a Snowy Owl and is actually played in the movies by male birds. One main one and, at least, two back-up and stunt birds. The reason for this was, that male Snowy Owls are smaller, hence easier to handle for child actors, and whiter than female ones. The real name of the main Hedwig is Gizmo, the 'main owl actor', but it was actually an owl called 'Ook' that was casted the very first for a role in 'Harry Potter and The Philosopher's Stone', even before Daniel Radcliffe himself! And the third owl is called 'Sprout', yes, just like Prof. Sprout, the herbology teacher. All owls were trained by Gary Gero, who also trained Fang (Hagrid's dog) and the cat that plays Mrs.Norris. His, rather sparse, website can be found here: http://www.birdsandanimals.com. Many fans were deeply upset as Hedwig was killed at the beginning of 'Harry Potter and The Deathly Hallows' in 'The Battle of the Seven Potters'. Whilst it is shown in the film that she dies protecting Harry, in the book she is hit by a stray curse whilst sitting in her cage. J.K. Rowling stated in an interview that Hedwig's death symbolizes the end of his innocence and, relatively protected, childhood. 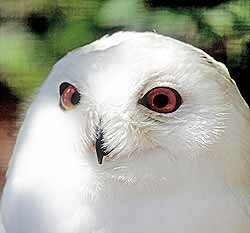 Hedwig, together with the Weasley family owl Errol, lives now >here< and can be visited by everybody. The one confusing bit about that website, apart of the ridiculous small print in the sidebar, is that it misspells Errol's name frequently as 'Eral'. The film music, the Harry Potter theme is actually called 'Hedwig's Theme' and was composed by John Williams. Bubo scandiacus, as the the Snowy Owl is known scientifically, is a large owl and is also known as 'Great White Owl', Arctic Owl' or 'Harfang' and is closely related to The Horned Owls. She has tufted ears, which are normally hidden in the plumage, a wingspan of up to 150 cm / 59in and can weight up to 3kg / 6.6lb. Snowy Owls don't hoot, they make more of a barking sound or a clap their beaks when agitated. It is a northern bird that is nomadic, following its preferred prey, and can be found in North America, Eurasia and, occasionally, the very north of Europe (Shetland Islands and Outer Hebrides). In 'Harry Potter and The Order of The Phoenix' Sirius Black refers to this as he advises Harry not to use Hedwig to communicate with him as she, as a not native bird, is too easily recognized. Snowy Owls are exclusively meat eaters whose preferred prey are lemmings, mice and other rodents, rabbits and similar. They will also hunt and eat other, smaller bird or fish. They need up to 12 mice / day, or the equivalent of that, and even more during breeding and nesting season. This means that one Snowy Owl will kill and eat around 4500 mice, or their equivalent in other species, per year! Like other owls they swallow most of their food whole and regurgitate the parts they can't digest later. The content of these regurgitations are, because of their form, called 'owl pellets'. They have few natural enemies and the parent owls are always watchful to protect their ground nests against foxes, wolves and similar. Do Snowy Owls make Good Pets? Harry Potter HBP Puzzle "Hogwarts and Hedwig"
Put the pieces together to show this picture of Hedwig from Harry Potter and the Half-Blood Prince! 1,000 pieces - when complete measures 20 x 27 inches. Great page on Hedwig. I was very upset at what happened to him :( There are many cute Snowy Owl plush toys which make better 'pets' for kids than the real thing, I'm not a fan of caged birds.